From the general hubbub at Toronto’s Music Hall last night, where the first round of “City Idol” was played out, one short speech resonated above all. Surprisingly, it did not come from the stage, where 82 would-be city councillors had displayed their wares for a precisely measured 60 seconds at a time, but from an audience member, near the event’s end. Even Mez himself seemed momentarily taken aback. He had been about to explain the method of counting ballots. Instead, he gazed into the darkened crowd in front of him to the source of the call, and grinned for a moment. “That’s not on the table right now,” is what he finally said. Right now. David Miller, take heed. Dave Meslin is a guy we’ve known a long time: a planner and an organizer, a schemer and a strategist. We still remember his presence at an early “Dundas EAST” meeting, when we were first talking about what to do about the problem of speeding traffic on Dundas Street East in this end of Toronto. The main problem with the street was that while it had four lanes of traffic, only two were ever busy at a time, and even that for only about one hour a day. The other 23 hours Dundas was an empty speedway. People who were used to the status quo could all see the problem, but no one had any convincing solutions. About the most radical gesture that anyone came up with was to change the centre lane to a counter-flow with a red light to regulate which direction traffic could go in. Think Jarvis Street. Not very nice. This was a great counterpoint to the Canadian Auto Association types who had been proposing all the houses bordering the road be torn out to make the roadbed wider. It had the result of moving us into a fruitful discussion where the elimination of two lanes of car traffic could be painted as a reasonable compromise. Today Dundas East is a remarkable success story, where cyclists and motorists, residents and pedestrians, dog-walkers and school kids all seem to be getting along just fine. Mez eventually found a pressure point to which to apply his creative forces: the Toronto Public Space Committee, which he invented and inspired for several years. The TPSC’s main agenda is the elimination of the glut of corporate advertising that fills public spaces throughout the city. “David’s” TPSC has taken on “Goliath” in many contexts. They’ve even won some battles against city hall. The group puts out a great magazine, “Spacing,” and seems to be a magnet for creative and inspirational projects about city living. Several of the writers in the uTOpia book had TPSC affiliation. We last talked to Mez about a year ago at the corner of Spadina and Adelaide, and he mentioned he was burning out on the TPSC and wanted to do something else. He had been working with Toronto city councillor Joe Mihevic (he drafted, as we understand it, Mihevic’s proposed resolution to require sideguards on trucks in Toronto–the bill passed, but sideguards are still wanting [apparently it’s not enough that cyclists’ lives would be saved; it’s going to take the crushing of a Smart car or an Austin Mini before the province acts on the city’s resolution –ed.]). From this emerged the City Idol proposal: to reinvigorate city politics with new enthusiasm (only 38% of those eligible voted in the last municipal election), a talent show modeled on the TV reality programs would be launched. But instead of searching out pretty faces or good lungs, the search would be for strong ideas and new energy. The plan, part one of which played out last night in the Music Hall, is to let folks vote for the strongest candidates in a series of preliminary heats, with the eventual four winners receiving support and strategic counsel from the City Idol “machine,” in an actual run for council seats in the four districts that make up Toronto City Council. Ah yes. You have your machine politics, and then you have your politics machine. Mez, it would seem, is an inventor as well as a showman. Up on the stage last night, he told us to stick around. The speeches were over: some of them remarkable for cleverness, for clarity, for sense of style, or for moxy. All of them short. The voting was over. We had marked our ballots with the numbers of the five contestants we most liked (no easy feat) and passed them to ushers in the aisles with collection baskets. The “contestants” were in the lobby out front, Mez told us. We could talk to them as we pleased while the ballots were counted. The process would take about an hour, he figured. The hall was cold and most of us were ready to leave. “I give you the counting machine!” Mez said, and gestured to the white curtain behind him. It jerked upwards. On stage was a fantastic spectacle of some thirty or so people dressed like old-time bookies or accountants, complete with white smocks and green visors, bouncing to a staccato keyboard performance from Bob Wiseman (of Blue Rodeo fame). We watched them tearing the ballots into sections, dropping them into basins and transfering them into dishes and thence into bags, from large to small to smallest, the whole process a remarkable metaphor of a truly transparent democratic process. The rhythm and melody was kind of mesmerizing. We forgot our fatigue and the chill in the air. We got up and congratulated a few people we knew who had made a bid for the “Idol” title. We had a two-dollar chocolate bar. We talked with friends in the hall. And occasionally we watched the machine, tearing passing, dropping, and processing. As it processed the ballots it folded up on itself from stage left to right, until only one last table stood there, Mez and a few others gathered around it. The rest of the cogs of the machine linked arms and did a conga dance to the beat of the music. And Mez announced the cut: half would move on to the next level, half were eliminated. He was nice enough about it. He encouraged everyone to stay in the real municipal race, in fact, for the fall elections. Mez wasn’t among the contestants, not for “City Idol,” nor for councillor. Not for Mayor, either. But he won’t be eliminated. We figure he’s got the stage as long as he wants it. We stumbled into a Situation on the weekend. Known in the business as a charrette, a group of about thirty earnest souls, some professional designers of one stripe or other, some just gadabouts with a couple days free and the connections to put themselves in the right place at the right time, converged on the Toronto waterfront to take aim at the future of the Island Airport. Two days later, Jane Jacobs died. For who was Jane Jacobs, and what is the Island Airport? Answers to these questions will point to a much deeper mystery, an enigma, a conundrum: nay, some may even call it a conspiracy. Yes, yes, the news reports tell us Ms. Jacobs succumbed to “Old Age.” However, we are capable of reading between the lines. We know a little about Ms. Jacobs. We understand a little of the forces that kept her going, and we understand a great deal about the forces that she came up against. So while we do not blame Robert DeLuce, and while we do not blame Lisa Raitt, neither do we blame Mayor David Miller or Bill Freeman [What? –ed.]. Oh, sorry, not that Bill Freeman. This Bill Freeman. Fact is, we blame the automobile advertising that lines the pockets of the good burgers at all the newspapers that sang Ms. Jacobs’ praises since her death [jesus god, even for the ALLDERBLOB this is going to be a stretch –ed.]. First, the facts: the events of Thursday evening, all day Friday and most of Saturday were organized by an outfit with the glorious name, “Office for Urbanism.” They have a website, and you can visit it, but last we looked it was “under construction.” Nevertheless, a googling we would go, and went, and a questioning of our friends and contacts we would do, and did, and the “Office for Urbanism” turned up in only the shiningest of lights. There is no evidence that their brand of “urbanism” is anything but the very uttest of the utmost. If they know the phrase “Urbanism is to cities as advertising is to Coca-Cola” they give no evidence of it in any of their work. If they know that the line from Urban Designer to PR flack is paved with good intentions, they gave no coherent evidence of this. Instead, with straight face and hand steady on the laser pointer, one Jennifer Keesmaat of the OforU rolled straight into the introduction of the task at hand on Thursday night: no less than a complete makeover of the forlorn Island Airport site, helped along by “Fresh Eyes:” outside experts whose presence was to lend a new perspective on the situation. These Fresh Eyes included Dominic Papa, an architect from the Netherlands who teaches at the A.A. in London [hic! –ed.] (not that A.A., this A.A.), Michael Gordon, senior urban planner for Vancouver B.C. and skateboard activist, and Michel Rojkind, an architect from Mexico City. In addition to these “Fresh Eyes,” the charrette organizers brought in “facilitators” [“stale eyes”? –ed.] from their own firm, from Janet Rosenberg Associates (landscape designers), from Hargreaves Associates (urban designers and landscape architects based in New York and Boston), and from Toronto’s Planning Partnership. Thursday evening’s participants included anyone from the general public who heard about the project and wanted to lend their voice. After Ms. Keesmaat’s introductions, we broke out into about six tables, where an attempt was made to pull together a consensus for the designers and “fresh eyes” to work from. He was interested, we supposed, because the Port Authority is massively upgrading the existing ferry across the 110-metre shipping channel to the airport site. They’re planning a hydrofoil, we hear, to take passengers from the door of their arriving craft to the foot of the tallest office buildings on Bay Street. “What ferry you talking about?” he wanted to know. But he wasn’t about to tell us anything about the ferry. He was there to observe, and practice his thumb exercises. After about an hour of this consensus-building, we reconvened at the front and a member from each of the groups stood and presented the points they agree on. Don’t worry, we aren’t about to list them all. We will list one point though: the island airport site is to remain free of private motorized vehicles. On this point each table agreed. It was anonymous [okay, quit fooling around –ed.]. It was unanimous. We had the good fortune to find ourselves at Janet Rosenberg’s table on Friday morning. We must describe Ms. Rosenberg’s method of facilitation. Our moles at the Toronto Star, “Giles Gherson” and “Michael Goldbloom” (not their real names) revealed a little of the “behind the scenes” process that went into the section’s development. Apparently, there was much discussion of the section’s title. “Your First Global Warmer” (too technical). Two bicycle riders were killed yesterday here in Toronto. A male cyclist; a dump truck; both going South. It was the evening of the day the cyclist was killed on Avenue Road. The trailer rolled over the cyclist. She was killed. Expand the carfree spaces in the city! Demand the Toronto Coroner’s call, for large trucks to be fitted with wheel guards, be enacted! It’s coming up on my 47th birthday and in honour of the occasion I’ve been looking into the diaries I used to keep [“my” birthday? “I”‘ve been looking? Did someone eat a poisonous mushroom? Seriously, what is up? –ed.]. It’s me here, Jacob Allderdice. I write this stuff. I write the ALLDERBLOB. I’ve come to refer to myself in the first-person-plural, as “we.” I started doing it one day, and I liked it. I’ll probably go back to it [Whew. Ain’t that a relief! –ed.]. I’m with Whitman. We do not say these things for a dollar. But mostly it’s to disguise myself, here behind my wall. I’m sitting here hurling the flaming lobs, but it’s not just me, right? It’s me and all the people in my boat: the people who can imagine a world without cars, and can see how a moratorium on automobile advertising could be a step in that direction. Anyway, that’s what I tell myself: I am large. I am Blobby. I say it rang “hollow,” not that it rang untrue. Because how often is we hide our loathing of something behind an attack on its apparent opposite? It’s classic behaviour, from homophobes who fear the feminine in themselves, to zenophobes who despise their own mixed backgrounds, to zealots and bigots of all stripes who wish to god someone would just kill them and put them out of their own misery. Maybe there’s a little of that in me, with my lashing out at automobile advertising. When I jeer at advertisers for being “artists who have nothing to say,” aren’t I secretly patting myself on the back for finally, finally, having something to say myself? From the time I was 13 or so, from 1972 on, I used to write with some regularity in a diary–or “log,” as I called it (because “diaries are for girls”). I logged for about 20 years in a fairly consistent fashion. In 1992 I got married and it’s around then that I quit the habit. Not that I had no more secrets. Not that I had nothing more to complain about. Not that I didn’t still need the “help” keeping a log is said to provide. But writing a diary lost some of its zip, somehow, as I neared age 35. The fact is, the woman I was living with, who I subsequently married, had come across a diary I had been keeping, and read enough of it to develop serious doubts about my devotion to her. Oh, I was devoted, I assured her. I said I’d prove it to her. We got married. And some time later, after many many arguments, we got divorced. It’s a bad move to read the diary of someone you think you know. Take “Travels with Charley,” for example. In it John Steinbeck, the great American novelist, champion of the downtrodden, writes a first-person account of his friendship with a little poodle. Steinbeck reveals himself to be a mean-spirited, conceited, unpleasant little man. You come away wishing you could turn back the clock to your decision to pick up that book. Ugh. My dad kept a diary in his youth, he told me. He grew up in Montana, on a homestead ranch. He worked as a cowboy on the giant McNamara ranch. He was in the U.S. army during the Korean war. He went to university on the G.I. bill, where he met my mother, who was from a Boston family of Unitarians, her dad a banker and investment counsellor. It might have been interesting to read my dad’s diaries. Maybe embarrassing, but interesting. But he threw them out. Let’s say you’re getting married yourself. Would you throw out your diaries? Do they represent baggage from the past? Isn’t it smarter or safer to jettison them so your balloon will soar? If you believe the mantra of the de-clutterers, any book you haven’t read for two years is dreck. Get rid of it. But you’re the one who takes the recycling box to the curb. You see the diaries in the LCBO bag where she puts them. Jesus, you’re thinking, someone could find these. Someone could find them and read them, and someone’s secrets would be there for the world to know. You’d pick them up, right? You’d be protecting yourself as much as your girlfriend. You’ve got a stake in those books–assuming she’s written about you occasionally during the past five or so years. I mean, you’ve been together all that time. She would have written about your first date, and how she knew from the minute she laid eyes on you, and all that. She’d have written about your fights, and your struggles, and your high points together… Right? Better fish those books out of the trash. But take my advice: don’t ever look at them. Never, never. “What’s eating you,” your editor asks [Oh, sorry, was that my cue? Actually, I was napping –ed.]. Like I said, it’s coming up on my birthday, and I’ve been delving into those diaries I used to keep. It’s a big stack. A book a year, at least. There’s what, 25 of them? It’s worse when you read your own diaries. With your own diaries, you have two storylines to follow. You read the junk you wrote about your life, and sometimes it’s interesting, or sad, or funny, or dull. But you have this other line that’s in your head, like an editor tapping his fingers and saying “What a bunch of crap” […um… –ed.]. This other line is the story that you didn’t write. It’s what really happened, that you ignored, or denied, or didn’t notice. You read your own diaries and what stands out are the half-truths, the self-agrandizing statements, the lies you told yourself in order to get by back then. All life long, the same questions, the same answers. What kind of monster would drive that car? It’s been suggested to the ALLDERBLOB that we accept cash in exchange for running a small advertisement or two. This does not seem like such a bad idea. We have long envied the incomes of those “artists without anything to say” whose toil is so richly rewarded. 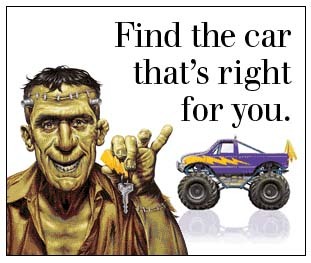 Seeing as how it’s coming on Easter, that most holy of times in the car-dealership patch, we’ve been wondering about the ad running in “Canada’s Car Advertiser of Record” that features a Frankenstein-type monster with the keys to his new monster truck. What kind of monster drives that car, we’ve frequently asked ourselves, and the Globe and Mail would answer that question we guess. 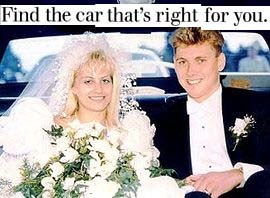 What kind of car did Paul Bernardo and Karla Homolka drive when they lured their victims to their ultimate death, for example? On April 16, 1992, the couple drove into a church parking lot. Homolka stepped out of the car with a map pretending to be lost and asking for help from 15-year-old Kristen French. Bernardo approached her from behind and used a knife to force French into the back seat of the car. A piece of the map, one of French’s shoes and some of her hair were all later found at the crime scene. They brought French to their home where for several days they sexually assaulted, abused, and tortured her. They killed French just before going to Easter Sunday dinner at Homolka’s parents’ home. On April 30, her body was found in a ditch in the city of Burlington, Ontario. How easy was that? Now, when does the money start rolling in? Nobody ever accused the ALLDERBLOB of originality. In fact, like most cyclists, we are lazy. Like most cyclists, we would rather ride to a restaurant than drive to a gym. Like most cyclists, we can’s see the point of working an extra four months each year just to earn enough money to afford a car. We would rather sit in cafes reading the newspaper. We mumble to the point of incoherence. We copy and paste whenever possible. We read in The Toronto Star on Sunday the headline above. What immediately sprang to mind was a “Victims of the Automobile” post. Being lazy, it’s taken a day to put up the post. Being lazy, it’s more than we can bother with to make up our own headline. Maybe by next week we’ll get around to an update on what’s being called the “worst mass murder in Ontario’s history.” Unless the paper wises up to the daily carnage [pun intended? –ed.] on our roads between then and now, in which case we’ll be all over the news. GM [that genetically modified car company –ed.] has inflicted itself with a virus of massive proportions. Its “apprentice advertiser” campaign, which we wrote about here and here in the past couple days, has found press on the front page of the Toronto Star (with a pointer to Zerbisias’s column found here) and that Star wannabe, the New York Times (with a pointer to page one of the business section, where the story vies for attention with one about GM’s cutting off [shurely you mean “selling off” –ed.] its profitable car loan arm). Nightline, the U.S. TV news magazine, was also reported to have produced a segment about the rash of spoofs. Of course, no one scooped “The church of the Customer Blob,” which called the GM campaign “not consumer-generated marketing,” but a “viral game” as far back as March 17. So, how soon are we to see the virus-riddled body of GM being dragged through the streets [if not bankruptcy court –ed.]? Not soon at all, according to Zerbisias. Fact is, she writes in her column yesterday, we were all taken in by the “evil marketing brains with their MBAs and metrics and buzzwords and cool-hunting ways” at GM. In fact, contrary to what some have predicted, nobody at Chevy or its ad agencies is gonna hear “You’re fired!” for this. Not sure if Zerbisias is talking to us with that one (although we did post the “you’re fired” line to her comments forum), but we still think it’s heads, not wheels, that will roll at GM after this freakish campaign. In fact, we think Zerbisias, for all her intelligence, has been suckered by the pod-people at GM “spin central.” We think they’re doing, in the words of one of Zerbisias’s commentators, “counter-counter-spin” on this one. (quoting “the industry blog Adrants”). Okay, people. You’re right, GM’s smart after all. They knew this would happen. They suckered all of us and they’re laughing all the way to the dealership [can’t laugh all the way to the bank anymore, now that they’ve sold GMAC –ed.]. So why can’t we see Dana O. Still’s original spoof ad, the one that Zerbisias first posted on Friday, the one that got the ALLDERBLOB rolling with this theme? Try the link, and all you get is “dead air.” And there are a few others like that. But you can still view ours. You can still see the one Zerbisias made. Why? If you go by the spin passed along by Zerbisias and Bedows, you’d think the genetically modified car company [thank you –ed.] is pleased as punch to have these things floating around in cyberspace. she wondered about the ads that are no longer there, so I told her that those submitted to the contest were silently deleted by Chevy, rather than received as the constructive criticism we intended. However, those that weren’t sent into the contest – just emailed and saved – are still viewable, along with those on YouTube. We still think that’s exactly what’s going to happen to the contract of the Campbell-Ewald company, in Warren Michigan, part of the Interpublic Group of Companies [you said a mouthful –ed.]. They’re the gang responsible for the sickening mess [shurely you mean “the advertising campaign?” –ed.] that GM’s gotten itself into. And try as they might, we refuse to be counter-counter-spun by the re-tread tire dealership that is GM. You are currently browsing the the ALLDERBLOB blog archives for April, 2006.